Gaslighting: it’s real, and it happens more than we even realize. What does gaslighting in relationships mean? Gaslighting is a slow, torturous form of manipulation, victim blaming and emotional abuse. It’s gradually being fed a poison through words that creep into our minds and gnaw away at any semblance of self-worth and happiness inside our heart. The worst part is, you don’t even realize it’s happening until it’s too late and the damage has already been done. Often, the lover who holds us hostage through this tactical method is a cunning, charming type. We are blind to the writing on the wall because we’ve been conditioned to see our abuser as wonderful; our heart is already ensnared within their clutches as the first signs that something is wrong start to wash over us. But what does gaslighting really look like in a toxic relationship? What does it cause us to believe as reality? The harsh reality is, well, it can really look like anything and convince us of infinite fallacies. 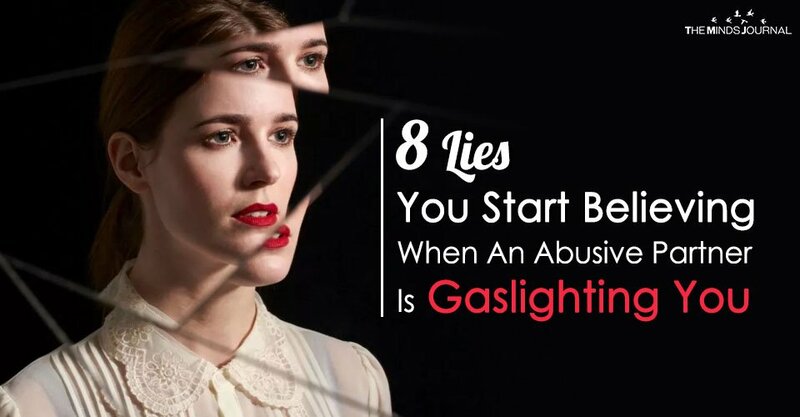 The thing is, though, they really all can intertwine and start to sound the same, but here are a few examples of lies that you’ll start to hold onto as truth in an abusive relationship if someone is gaslighting you. How do you keep someone caged? You trick them into believing that the cage is the best place for them. The same is true for a master manipulator; they hold you close by blinding you to the possibility that things could or should ever be different. They’ll sow the seeds of trickery that blossom into a belief that they are your salvation, that, without them, you’d quickly perish from loneliness. Sometimes simple phrases like, “What would you do without me?” or “You need me to take care of you,” can become a blindfold or rose colored glasses that never allow us to see others around us who may also care. Ah, yes, the mind games to convince us we are crazy… they are all too common in these types of situations. Truly gifted gaslighters will create an illusion that even your five senses can’t be trusted, that your eyes and ears are failing you completely. There’s no danger; you imagined those times they slammed doors or shattered glasses. The reality, though, couldn’t be farther from what we begin to believe at the hands of our hurtful lover. Master manipulators know how to spin yarn that completely alters our self-image. One clear sign of someone who gaslights is the way they project blame and try to shame the victim. By convincing you that you are “hard to love” or “too much,” they are made out to be heroes or saints because they are willing to “deal with you” or “stand by your side” despite these (non-existent) character flaws. This one can really become all-consuming and develop into a serious problem. Like all the other tactics, it starts with seemingly small things. The dog destroyed a pillow? Well, clearly, it’s your fault for leaving it there when you know it’s the dog’s spot. Passed up for a promotion at work and you feel it was discriminatory? No, you just need to learn how to actually do your job well and get recognition. This can go into extremes, like having the person blame you for their own struggles, addictions, and self-destructive behaviors. And, speaking from personal experience, once the damage is done here, you’ll find yourself living your life with a constant sense of shame and blaming yourself for literally everything that happens in the world around you. One thing that partners who gaslight love to do is tear you down. But, because everything is a carefully planned strategy like a game, there has to be a way to go back and clean the slate so that it doesn’t seem like they are mistreating you with their words.